This post has been cross-posted from Henry Jenkins’ blog. If you don’t have time to read this article in full, the easiest way to skim information about this topic is to visit http://americancensorship.org/. In the past year, we’ve dealt with various novel political moments around the world that have been enabled or augmented with networked technology, from Anonymous’ global “hacktivist” incidents to the numerous protests in the Middle East, topped off of course with the vibrant grassroots protests of the Occupy movement. Over the last few months, we’ve also seen another interesting case study taking place in American politics: rampant opposition to the Stop Online Piracy Act, dubbed as “the most important bill in Congress you may have never heard of” by Chris Hayes of MSNBC.com. Watch Chris Hayes’ interview for a good introduction to the debate around SOPA. SOPA, a bill currently making its way through the House of Representatives (along with its sibling PIPA, the Protect IP Act, currently in the Senate) has faced weeks of protest from Internet companies and users alike. Why? Well, on Google Plus, Sergey Brin — cofounder of Google — likened the potential effects of SOPA to the Internet censorship practiced in China, Iran, Libya, and Tunisia. Basically, to protect against international copyright infringement, SOPA allows the US to combat websites (such as file lockers or foreign link aggregators) that illegally distribute or even link to American-made media by blocking access to them. Theoretically, the bill has dangerous implications for websites that rely on user-generated content, from YouTube to 4chan. Many have already written about the worries that SOPA and PIPA cause, such as Alex Howard’s excellent, in-depth piece over at O’Reilly Radar. For more information on the bills, visit OpenCongress’s webpages, where you can see summaries of the legislation, which companies support and oppose them, and round-ups of by mainstream and blogged news: SOPA + PIPA. The bills are one more step in a long line of anti-piracy legislation, such as 2010’s Combatting online Infringement and Counterfeits Act (COICA). However, for the most part, criticism — or even basic coverage — of SOPA remained an online phenomenon. While there have been a few online articles written on CNN and a couple other networks, the mainstream news coverage of the bills remain fairly nonexistent, reports MediaMatters, likely due to the fact that the television networks largely support the bill. The Colbert Report featured a pair of short segments on SOPA in early December. The Internet, though, largely worked around that problem. Especially over the past two months, we’ve seen an exceptional effort on the part of online companies to engage users with the political process to oppose SOPA. 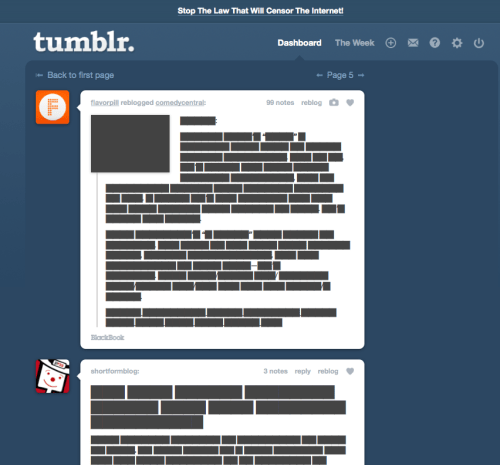 For instance, on 16 November 2011, Tumblr blacked out every image, video, and word on each user’s dashboard, linking at the top of the page to http://www.tumblr.com/protect-the-net, where users could call their local representative. The effort set of thousands of shared posts and hundreds of hours of calls. While other companies attempted similar experiments (like Scribd on 21 December), Internet leaders joined together to spread word and inform Congress (such as with this letter from Facebook, Google, and Twitter on 15 November, and later this letter by many others on 14 December) and even political opponents of SOPA reached out on social media, like when Senator Ron Wyden asked people to sign their names at so he could read the list at a filibuster. Other experts eventually spoke up too. But perhaps the most intriguing political effort occurred within one specific online community: Reddit.com. Humorously, every activist-related post on the official Reddit blog is tagged with “do it for splashy. In terms of more prominent political activism, Reddit’s community — particularly it’s subreddit, /r/politics, and the emergent subreddit /r/SOPA — has unified around opposing SOPA, in line with the free-speech, utopian personality that pervades the site. For instance, a couple posts on /r/politics and r/technology that reached the front page [1, 2] helped bring rapid visibility to Senator Wyden’s filibuster initiative. A more effective protest occurred in the form of a website boycott. GoDaddy, the domain register, was discovered to be a supporter of SOPA. After some discussion on Reddit, one r/politics thread reached the front page: GoDaddy supports SOPA, I’m transferring 51 domains & suggesting a move your domain day. Visibility of SOPA-related content was aided by a new subreddit, r/sopa, to which a global sidebar linked from the Reddit homepage. Less than 24 hours after the boycott started (even though, by numbers, it was deemed hardly successful), and with two more /r/politics threads that reached the front page [1, 2], GoDaddy reversed their stance and dropped support for SOPA. SOPA debate continued to be fueled by various posts, including one by cofounder Alexis Ohanian: If SOPA existed, Steve & I never could’ve started reddit. Please help us win.. At the end of December, r/politics joined together to place pressure on SOPA-supporting Representative Paul Ryan; eventually, he reversed his position and denounced the bill. Most notably, Alexis Ohanian recently announced on the Reddit blog that the entire site would voluntarily shut down on Wednesday 18 January 2012 for twelve hours, from 8am-8pm EST. Replacing the front page will be “a simple message about how the PIPA/SOPA legislation would shut down sites like reddit, link to resources to learn more, and suggest ways to take action.” This blacking out of Reddit coincides with a series of cybersecurity experts’ testimonies in Congress, at which Ohanian will be representing and speaking. In reaction to SOPA (and PIPA, to which the opposition is now growing, since the SOPA vote has now been shelved), a vigorous public emerged across the web and united around discourse about the bills, particularly on Reddit.com. But to return to Kelty: is this a recursive public? Do the political users of Reddit have enough power and agency to maintain and modify their public? I believe this question gets at a deeper question of ontology: what does political participation mean in a 1) networked, and 2) editable age? For instance, some users are able to promote their skills for discourse — eg., My friend and I wrote an application to boycott SOPA. Scan product barcodes and see if they’re made by a SOPA supporter. Enjoy. — but in certain cases, participation in technological systems becomes participation in a recursive public because that participation helps modify the system. In the case of Reddit, participation can become political when content reaches extreme visibility. And this is particularly important when we reconsider that the mass media has barely covered SOPA as a topic: due to this conflict, participation on a network platform like Reddit becomes an inherently political action. In a recent New York Times article, Reddit’s political actions were noted. “‘It’s encouraging that we got this far against the odds, but it’s far from over,’ said Erik Martin, the general manager of Reddit.com, a social news site that has generated some of the loudest criticism of the bills. ‘We’re all still pretty scared that this might pass in one form or another. It’s not a battle between Hollywood and tech, its people who get the Internet and those who don’t.” Of course, Reddit isn’t the only platform that is part of this important recursive public, just as Twitter wasn’t the saving grace of the Arab Spring or the Iranian Revolution. The efforts of hundreds of activists around the country have contributed immensely to the anti-SOPA effort. But keep in mind that Reddit has reached a pinnacle of political participation in the last few months, and I have a feeling that — like YouTube in the 2008 presidential elections — Reddit may be the site to watch in 2012. Alex Leavitt is a PhD student at USC Annenberg, where he studies digital culture and networked technology. Recently, his work has focused on creative participation in immense online networks, examining global participatory phenomenon like Hatsune Miku and Minecraft. You can reach him on Twitter @alexleavitt or via email at aleavitt@usc.edu; to read more about his research, visit alexleavitt.com. What’s the difference between SOPA and PIPA?